Automation is one of those things that makes life a little bit easier. I’m certainly someone who likes to automate wherever I can, and nowhere more so in my digital notifications. As a Rise.global regular I look out for updates to my score on Twitter Followers Club and Twitter Activity Club. I am actively trying to improve my use of Twitter at the moment so I find both boards provide helpful analytics for me to optimise with. However, the updates come via email and I’m also someone who gets a deluge of email so the updates are sometimes missed. This is where Zapier comes in for me – Zapier is a kind of bridge between different software systems. If something happens on one system, it can then trigger activity on another. Adn Indeed it does, Zapier supports “Pushover” a dedicated notifications service for my mobile. So all I needed to do was to get Zapier to look out for releases of the boards I’m interested in and then get Pushover to notify me of my latest score directly onto my phone. Now you can see, alongside my other phone notifications I get my latest Twitter Followers Club score. Because this is Zapier, I could have done this for a whole host of others services too such as adding a new to do item to Asana or a new card on Trello. I can even configure it to post out to Twitter on my behalf, letting my followers know my awesome new score. Automation made that bit easier with Zapier. If you’d like to use the Rise.Global Zapier app then follow this link to gain access to the beta. 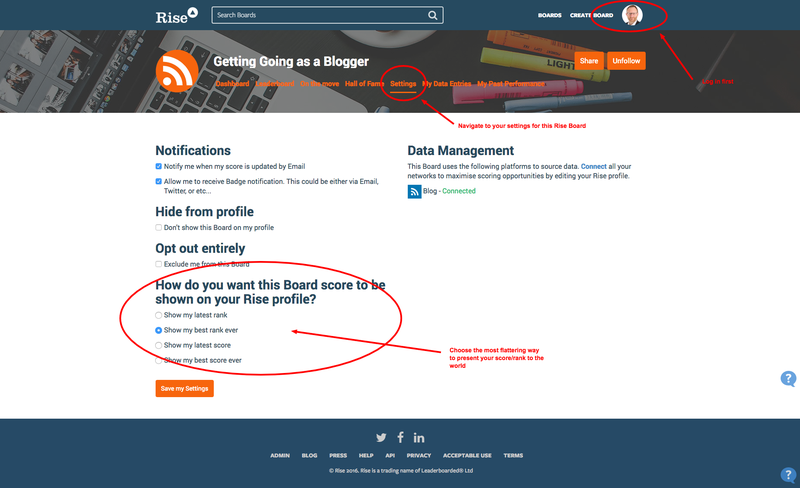 You’ll then be able to use Rise as an app on your own Zapier account. If you’re interested in copying me and setting up a notification for yourself then here’s how I did it, step by step. You’ll of course need your own Zapier.com account to do it. Now choose which Rise Board you want to be the trigger for activity each time it releases (typically weekly for most Rise Boards). Now set up the Action. I chose to use Pushover but you could use a different app you’re more familiar with. Now inside your notification, and this is the fiddly bit, you need to define the message that you want to send, each time the release occurs. Here you can see I am using Board Name, the name of the release, my score and my rank as the merge fields. That’s it, test your zap and then turn it on. Now sit back and wait for your personal analytics news to come to you! 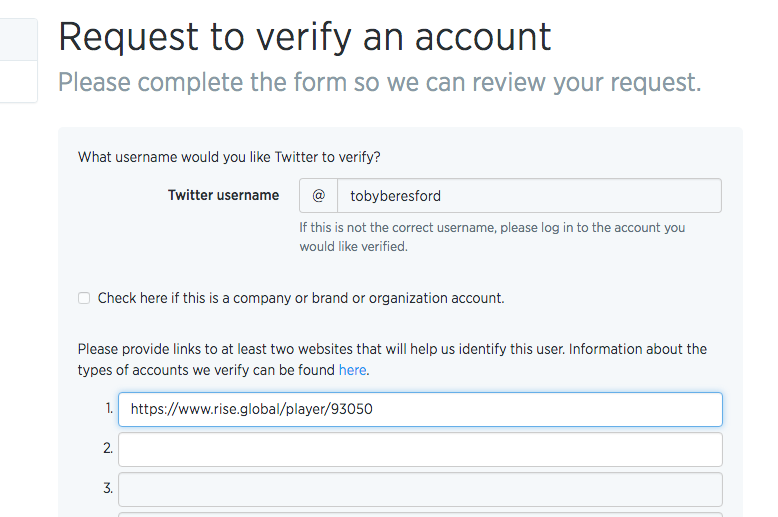 Twitter verified accounts are all the rage, especially for senior influencers across the web: using your Rise.global profile will help you justify verification. Now Twitter has opened up the verification program to allow self nominations, it’s time for you to request verified status for yourself. An excellent URL for doing exactly this is your Rise profile. 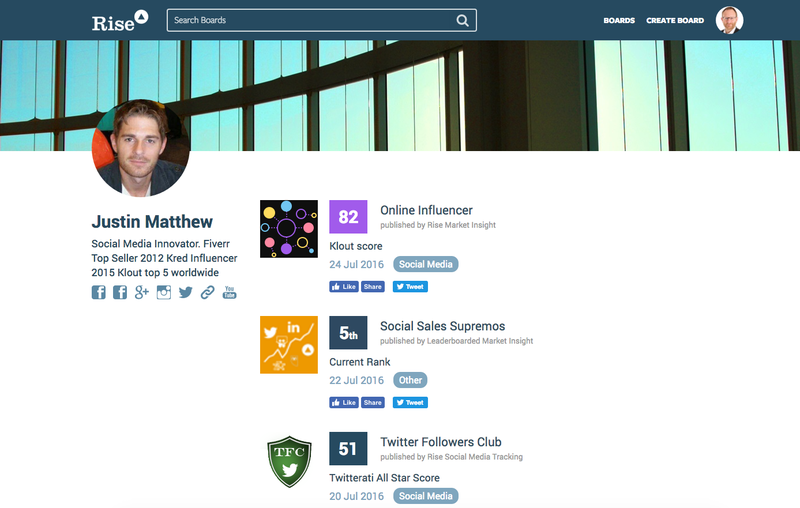 Your Rise profile shows the fields you are influential in, and your current score or ranking within those fields. 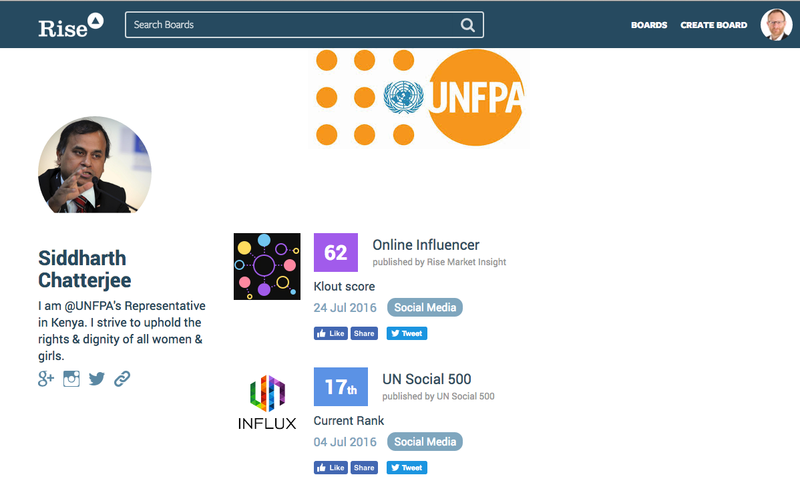 Because your score is regularly being updated, the team at Twitter can be assured that it is an accurate and up to date reflection of your influential status across one or more fields. Here’s my current Rise profile that will be seen by the team at Twitter. If you haven’t got a Rise profile yet then it’s easy to get one. Simply sign up to Rise and connect your social media accounts. Then, if you haven’t been added to any boards yet, search the Public Boards to find relevant communities, then use the Join button to request inclusion on the board. Please note that Twitter alone is responsible for grading whether your account is suitable for verification. Your use of a Rise profile as a submission URL should accompany other materials showing you to be a figure of public interest. The G.E.R.M. model (Getting Going, Engagement, Reliable Reach, Monetisation) focuses your scarce resources by making you track and evaluate only the metrics relevant to your media channel’s stage of maturity right now – this forces you to only analyse what you plan to optimise. Keeping track of metrics on your digital channels is hard, really hard. For one, there are just so many channels (web, twitter, mobile, facebook, email) and then for each there is a different set of metrics (visitors, retweets, downloads, likes and so on). Who is to say which metrics are worth tracking and are actually important? Today, we all default to tracking the “vanity metric” which is reach. The number of people your channel purports to reach. It’s a vanity metric because it is easy to track and makes us feel important – how many visitors, how many fans, how many followers, email subscribers… But vanity metrics say nothing about the health of our channel. What’s the point of 1 million followers if you never tweet? What’s the point of 10,000 fans if they never engage? What’s the point of 1,000 downloads if they never buy? That’s just it, vanity reach metrics alone are not enough to create a successful media channel (and that applies to old media just as much as new.) To be successful you need to track the other metrics that matter to you. This is where GERM comes in. It helps you arrange your metric tracking into four sensible buckets each applying to a different stage of your channels development. This will free you up because the GERM model requires only that you look at the metric of the current stage. If you’re just getting going, you don’t need to measure whether you’re monetising. If you’re focusing on building engagement, you don’t need to worry about growing your reach. This will give your evaluation efforts, a real focus on what matters right now for your channel. Let’s have a look at the four stages in detail and give some examples of metrics applicable for each stage. We’ll use Twitter as our example channel here but it could be any media channel. The principles are the same. At the getting going stage, your channel is in its infancy. Right now your job is to create content consistently. Can you set a content volume target and reach it, day in day out. It’s more important that you are consistent in when you post than how much content you post. There are plenty of monthly magazines out there still going strong. At the Getting Going stage your metrics are all about how consistent you are: how many tweets per day, blog posts per month for example. In engagement the question is really – are we relevant to our target audience. Every media channel needs a target audience (if you don’t have one defined, go back to the drawing board and describe it now!). Engagement is all about measuring whether the content you are producing is engaging and interesting to your target audience. On Twitter we might count number of retweets, particularly those from people we see as our target audience. At a live event this might be number of questions, on the web it’s average dwell time. Do you have a reliable audience that is tuning in to your media channel on a regular basis? This is all about creating a reliable reach – people who are listening to what you have to say. Virality is about ensuring that your reach is growing, ideally through word of mouth which costs you nothing. Metrics to measure when you are focusing on your reach include bounce rate if you’re on the web, % growth in number of followers per week if you’re on Twitter. Fourth and finally it’s time to think about monetisation. Are you reaping the financial rewards you want from your media channel? And in this context monetisation is any business objective you have for your media channel – it could be to view some adverts, make a donation, subscribe to a list or even visit another media channel you own. The exact metrics you measure here will depend on your specific business needs. Most people don’t monetise directly on social media so the monetisation metric on Twitter tends to be the number of referrals it has driven to the website. So there you have it – GERM – a nice easy to remember acronym to help guide you in building an effective media channel. I’ve started using it myself and it has exposed a key weakness in my personal social media brand – particularly on Twitter – I am simply not consistent enough with my posting. Some weeks I post over 20 times, some nothing at all – clearly this isn’t a real media channel. I’ve now started to use Buffer to pre-load and schedule tweets which has definitely helped me. Next up I’m doing strategy work to ensure that I’m tweeting about the topics that are going to be of interest to my target audience. Does Rise have any free tools to help? Well funnily enough there is the free Twitter Activity Club to do the tracking of tweet consistency (for those at the Getting Going stage) for you. Each week it emails with a count of tweets and average tweets per day. It then compares your work rate with the previous week to give you a measure of whether you’re getting better or worse. 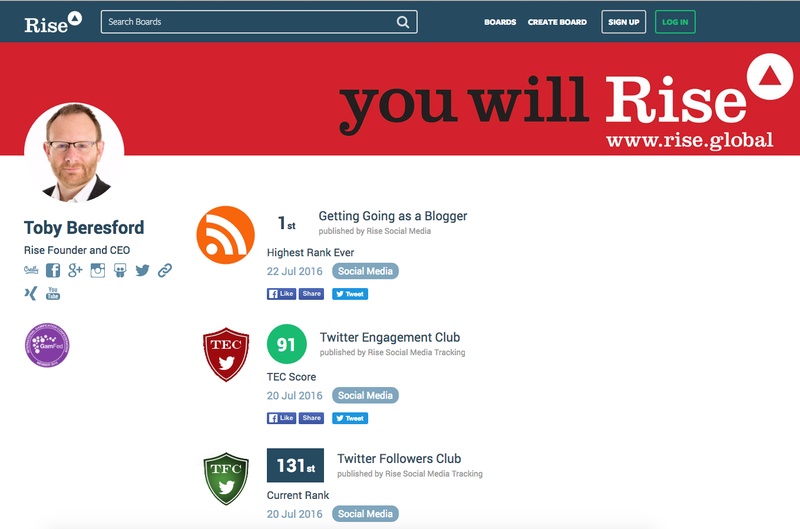 I recommend you join the Twitter Activity Club Rise board with your Twitter account and email address and you’ll start seeing your weekly score come through. It’s a great way to get going and to measure what’s important first when it comes to your media channel metrics. As a leader, one of your jobs is to keep those you lead focused on the goals you are trying to reach. An underused tool in every leader’s toolbox is to create and share “the score”. “The score” is how you have decided everyone should measure success, whether as individuals or as a group. Whether we realise it or not, we all take account of the score in our daily lives. Indeed, if you don’t share the score, people will invent their own. This can have hideous consequences as people chase after the wrong activities. No, it’s far better for you to take control of the score by choosing which KPIs matter and communicating them clearly. As a leader it is your job to identify the scores that matter for the objectives you are seeking. To do this, first write out the objectives and the success criteria for those objectives. These may be fairly numerical already. Then break down those objectives into the constituent parts and identify the important signals that you can measure reliably and easily. These are the metrics that go into making your score. market comparison – in more mature markets it may be more useful to focus on the comparison with peers – e.g. we are the number 1 supplier of milk in our region. Finally, as a leader it’s not only your job to identify the scores that matter but also to communicate them regularly. This could take many forms from a weekly email to a big screen TV leaderboard in the office. Whatever you choose, you need to remember that facts don’t speak for themselves. The medium you choose is important – people will take more notice of a leaderboard engraved in stone than one hastily scrawled on a piece of paper! The score is an essential part of leadership. We all take account of the score whether we realise it or not. As a leader you can leverage the score and its communication to achieve the goals you’ve set for your team. A great example of the importance of leaders and ‘communicating the score’ has recently taken the world’s media by storm. The Republican Party or Grand Old Party (GOP) Presidential candidates for the 2016 US elections recently debated each other on Fox News and presented to the audience what “scores” were important to them to keep and raise for the country. From here on in, how these individuals communicate their leadership goals to the people will be paramount. The use of Social Media will be more important than ever in reaching out and speaking to the electorate. Interested in how much influence you have online? 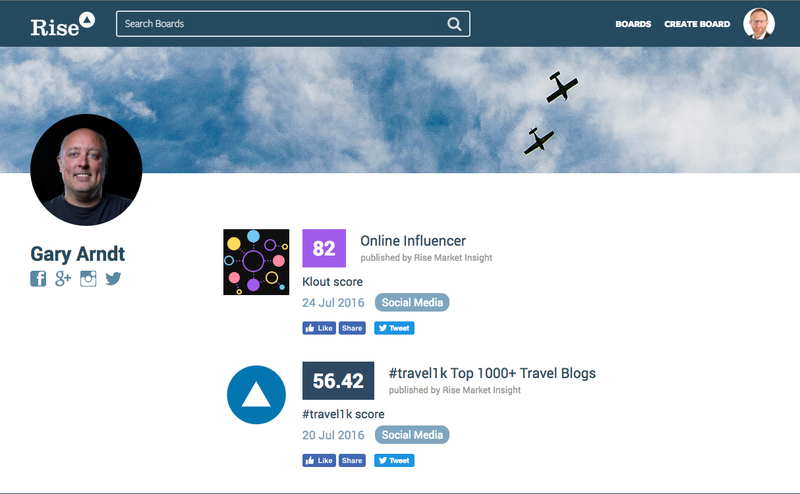 Why not join our Online Influencer ScoreBook and see how you compare?